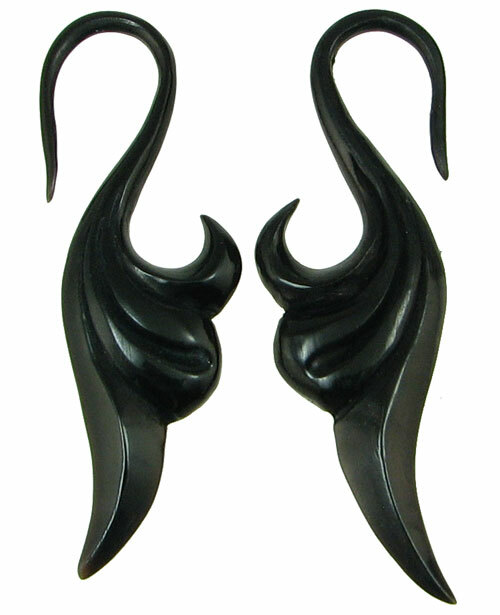 These hand carved dark water buffalo horn Swan Hook Earrings were hand carved in Bali, Indonesia. These small gauge earrings hang down to accent the neck line. These earrings are sold in pairs, however, we have a couple of singles available at a great discount. There are also some mis-sized pairs available at a great discount, for example one piece is 5 gauge and the other piece is 7 gauge. See the drop-down menu below for details. 12 gauge pair 10 gauge pair 9 gauge single (-$11.00) 7 gauge pair one piece 5 gauge, one piece 7 gauge (mis-sized pair) (-$10.00) 3 gauge pair 0 gauge single (-$10.00) 00 gauge pair (+$5.00) Select your gauge size and click "Add to Cart".